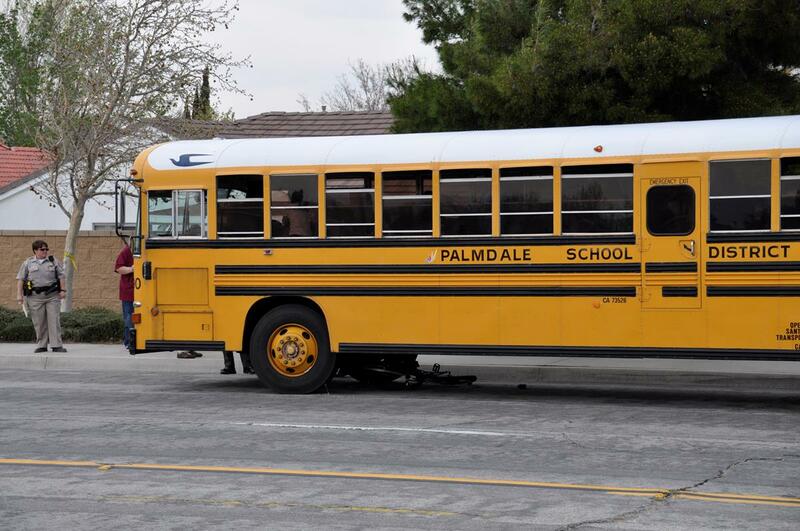 The school bus driver was not a Palmdale School District employee, according to a statement issued by the Palmdale School District Tuesday. “The Palmdale community is shattered by the tragic loss of a young man who attended school in our District and graduated from high school just last year. On behalf of everyone in the Palmdale School District, I want to express our deepest sympathy and full support for the family who lost their child. The news of this devastating accident reminds each us all that life is, indeed, precious. Yesterday [March 25], the District was contacted by California Highway Patrol and informed that a tragic accident involving one of our school buses took place at East 55th and Avenue R at about 4:00 pm. We were informed that a young man, approximately 18 years old, who was on a bike, was struck by the bus. He was taken to Antelope Valley Hospital, where he passed away. The bus was carrying about 50 of students from Los Amigos to home. All of the student passengers were physically safe, and I was informed by the California Highway Patrol office at the scene of the accident that the bus driver was tending to the children’s emotional needs. Ms. Esquer, Principal at Los Amigos, rushed immediately to the accident, and she personally took action to ensure that all students were safely returned to their families, and that an adult family member was informed of the situation. Additionally, Ms. Esquer delivered last night an all-call message to the Los Amigos families, expressing our sadness and ensuring them that the school staff will be watching students particularly closely as they process this tragic news. The District has taken action to place additional counseling and support services at the Los Amigos school site, to assist students and staff with the healing process. They will remain at the site as long as the principal believes is necessary. The bus driver is not a District employee. All District busing services are contracted through Student Transportation of America. Strict legal protocols guide the investigation process that follows an accident involving a school bus, and these protocols are being observed. 39 comments for "Palmdale School District statement on fatal school bus crash"
Finally the decided to paint stop traffic after 2 more accidents. But is done next lights. The car driver will likely see some liability for stopping on a through street and creating the hazard. Its called proximate cause. If not for that car stopping and allowing the bicycle to cross against the right-of-way traffic, as they say. Tragic, nonetheless. The bus was following too close and driver did NOT have her eyes on the road. She should not have tried to swerve around the stopped vehicle. From the driver seat of the bus, she could have clearly seen a young man on his bike, in a crosswalk. Her eyes should have been on the road in front of her and she should have been driving at a rate of speed so she had control of the bus. Different tone now??? You challenged someone to see the 45 speed limit sign, they did and you were WRONG!!!! Now your saying that the driver wasn’t paying attention? We’re you or “your friend ” in that bus at the time….. If he was in a crossWALK he should have been off his bike not on it key word WALK then he would have had the right of way, other wise he is falling under all v.c. He basically ran a stop sign even if he stopped. Was the bus in the bike lane or was “Speedy” in the street? Main causes of bus accidents in Antelope Valley? This goes for ALL drivers on the road so give it up!!!!!!!!!!! Palmdale needs to adopt Mayor Rex’s “Bike Path” philosophy and replace driving lanes with bike paths. So, I guess the city of Palmdale is at fault now too? yup, things the city knows they should do but then ignores it because money issues or whatever, just pure negligence….you bet the city is Partly at fault!! That corner is accidents waiting to happen. where is the driver that the bus swerved around to avoid hitting the car because driving the bus she was distracted by kids or something else???? her swerving not to hit the car is how she hit speedy instead people!!! accept the truth!….the driver of car should be posting ALL over the place to TELL exactly how it happened!! The bus driver SHOULD NOT have been driving SO FAST that she had to swerve. Period. What was her hurry? Why couldn’t she wait a safe distance behind the car that was stopped in front of her. She should NEVER have tried to pass someone at that location. She could NOT see. Obviously. Go get a license and come back with your answer, bet it will be a whole lot different..
Darlin, I’ve had a license for a long time and a spotless driving record. I do not speed or drink and drive, and I turn off my cell phone when I drive. I pay attention to what is infront of me and around me at all times. I GET THE BIG PICTURE and expect the unexpected, at all times when I drive. A professional driver should do the same. She is being trusted daily with the lives of many children. I think she owes it to them to pay attention. Get a bus liicensce they go through a lot, it’s not do a written test,and a drive test.. Untill you know please don’t point your finger…..
@Suckit, I realize driving a school bus with a bunch of unruly kids would be a hard job. However, that, in no way should have affected her speed and the FACT she was not looking the direction the wheels were rolling. No excuse. There are rules for the kids on the bus. If they are not following the rules, she can take the bus back to the school and have them removed from the bus. She should not have been driving so fast that she had to swerve to not run into the back of a car stopped AT A CROSSWALK. She used POOR JUDGEMENT. Made a BAD DECISION in that moment. She may be a great person, however this sould not have happened and she is responsible. No one knows who is at fault at this point, but just on observation Many of these bus drivers drive school buses FULL of kids and Many times these kids misbehave at times….just a suggestion, Put more Staff on these buses to monitor behavior so the responsibility DOES NOT fall on the driver!….the driver should ONLY be watching the road at all times and NOT the rear view mirrors to watch what the kids are doing on the bus!!! I agree, bus drivers need to focus on the road. If necessary, put another adult on the bus to handle the kids needs. They won’t do that. That means money. They’ll just go along with grief counseling & call it a day. One day,Speedy will be reunited with his friends and family.Hopefully by the time goes by he will make new friends.Teach the angels soccer,the Speedy way.Rest in paradise.You are forever loved. Peace be with the departed and strength with the driver. God bless this mess. Bus driver should be fired. Careless and reckless driving could cost the lives of passengers in the future and many more innocent people. Sounds like the bus driver was doing below the speed limit, didn’t blow through a stop sign or anything else wrong. I actually feel for both the person killed and the bus driver who has to live with the death caused by this accident. Where you there?? you do NOT know what the bus driver was or was not doing! !…..it does not matter if the bus was doing the speed limit! it was going approx. 55 mph according to the CHP report. even 55 mph fatal to anyone! Oops my bad, the report said approx. 50 mph….still…. just saw the RECENT KTLA news footage and they report the CHP said the bus was going 50mph!! on the news the reporter who was on exact scene showed the speed limit sign being 45!!!! so HOW WAS THE BUS GOING UNDER THE SPEED LIMIT!!?? I live by the park the speed limit is 50 if you guys are looking for someone to blame its the city…I see many family crossing there and at night you can’t even see them.it was a unfortunate accident but without a light it was an accident waiting to happen. My deepest condolences to the valenzuela family. They should sue the city for their neglect. One person living with this versus hundreds of friends and family that have to know they won’t see their amazing loved one ever again that was only 18. He didn’t get a chance to start his life, he had so much potential, and the last chapter to his book was only the first, remaining unwritten. What does the speed limit have to do with anything? There were children in the street and a car stopped. She should have stopped untill t was safe to proceed. do you? you sound like you may have been one of the children o the bus. Everyone has pain in their hearts over this, but don’t BLAME other people, my mom once told me, don’t point fingers, because everyone you point 3point back at you… So don’t point fingers and this debate will end…? I hope not. I have no idea if there was even fault involved. Its easy to start pointing fingers but it could truly have been a freak accident. I am sure the details will surface, but for now I hope we all realize that it is a tragedy for everyone involved. Suckitup there is one person who can tell us all exactly what happened and that is the bus driver. However, I’m pretty sure she has been told to keep it quiet because of legal action. The over paid scam artists…oh I mean the lawyers…have already been recruiting. Sad on all angles.